One of my various responsibilities for the Northwest Ski Club Council is to answer the many telephone messages left with our answering service. The telephone calls range from informational (someone wants to get information on a particular club) to humorous ("I have a couple packages of 5-year-old ski wax I'd like to donate-who do I call?"). This past July, I answered a message left by a woman named Jean Saubert, who asked, "Would you accept a donation of trophies?" Jean Saubert was on the phone, winner of two medals, silver and bronze, in Alpine skiing at the 1964 Innsbruck Winter Olympics! The woman on the other end of the telephone line was Jean Saubert, who had won two medals, silver and bronze, in Alpine skiing at the 1964 Innsbruck Winter Olympics! "Oh my gosh, Jean, you're not giving up your medals!!" I cried. I panicked - I was already thinking that I was going to have to call Betsy Valian and ask if they had an "Olympic Skiers" display at the new Mt. Hood Museum. To my relief, she said no, that she was keeping the Olympic medals (I did tell her about the museum, though, just in case). I chatted with her awhile longer, making arrangements to pick up the trophies at her home the following Saturday. I couldn't help thinking that, geez, we have one of the premier athletes of the world, and a pioneer in women's athletics, right here in Oregon, and NOBODY KNOWS! Since I belong to Skiyente Ski Club, an all-women club that was founded in 1955, and whose goal is the promotion of women in skiing, Jean's story was of particular interest to me. 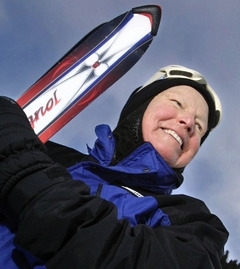 I was able to spend an hour with this fascinating woman, who is as much in love with skiing now as she was in 1964. Jean was born and raised in Oregon and trained on our own Mt. Hood and Mt. Bachelor. She made the 1964 Innsbruck Olympic team, along with Jimmie Heuga and Billy Kidd (see photo opposite). Even after her international ski career ended, she continued to race competitively, attending charity pro-am races as a former Olympian. She finished college in Utah, became a teacher, and took up soccer. One of her teams won a national soccer championship. Jean laughed, "I'm so competitive," she said, "that if I was sitting in a room stuffing envelopes, I'd have to stuff the most." Thanks to our new world of endorsements and other commercial endeavors, everyone can tell you who Picabo Street is. Tommy Moe and yes, even Oregon's Bill Johnson are known outside the skiing world. People still talk about Billy Kidd, whose bespectacled, cowboy-hatted countenance is recognized all over the world. But Jean Saubert - our outstanding American woman medallist? Zero, zippo, zilch, nada. The U.S. Olympic Team in Innsbruck won only six medals that year, and Jean brought home two of them. But you won't see her face on ESPN or NBC, American Express commercials or a Wheaties box like other past Olympic medallists. Does it bother Jean? Maybe a little. What bothers her more is the concern that teammates may not be as supportive of each other when they're competing for the same endorsement dollars. The fact that remains that Jean is an American skiing heroine, an Oregon treasure, and, thanks to my ski club and this council, I'm lucky enough to have gotten to know her. She's on her way to Utah so that she can, as she tells it, "get back in the trenches" and do some volunteer work for the 2002 Winter Olympics. Maybe this time around those network idiots will realize what a prize having Jean Saubert as a commentator would be. And trust me, if she comes back to Oregon, she's not escaping us again. Valuable used ski trophies, anyone?